Let’s be honest. An integrated or built-in refrigerator, like a Sub-Zero looks terrific in your kitchen. It fits into the cabinetry like that glass slipper on Cinderella’s foot. And just the mere mention of owning a Sub-Zero fridge makes you sound like a gourmet. But if you care about costs like I do, you need to know why the Rolls-Royce of refrigerators is worth the money. C&W Appliance Service is the only certified Sub-Zero Premier Partner and factory certified Subzero & Wolf appliance repair service provider in the Dallas/Fort Worth area and North Texas region. 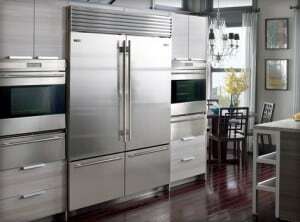 C&W also repairs Sub-Zero appliances in San Antonio. Our company, founded in 1957, has been repairing refrigerators for a lot of years, so we’ve seen a few brands come and go. This fridge lasts a long time, and routine maintenance is easy. But most incredibly, it keeps food fresher longer. What that means in dollars and cents is that there is less wasted food from spoilage or freezer burn. Take the Sub-Zero Freshness IQ Challenge to discover how you can make the most of your fancy fridge. You may notice that some fruits and vegetables dry out in the refrigerator or that ice crystals form on frozen foods? That happens because your fridge and your freezer are fighting about humidity levels. Most of your fruits and vegetables require high humidity to retain their moisture and flavor. Frozen foods do best in a dry environment, which prevents ice-crystal formation and freezer burn. Each Sub-Zero refrigerator and freezer has its own dedicated sealed systems with a compressor and evaporator. This dual refrigeration system allows you to control the temperature and humidity of each component. You don’t have one compressor doing two jobs – freezing and cooling. Do you store all of your produce in the same crisper drawer? Do you keep the apples next to your carrots, oranges and lettuce? You may be surprised to learn that apples, melons, peaches, and some other fruits emit ethylene gas. It’s a natural process – nothing dangerous – but the gas can make carrots taste bitter or cause lettuce to wilt or become discolored. The patented air purification system in the Sub-Zero refrigerator scrubs the air of ethylene gas and removes air-borne bacteria, mold and viruses. Clean air means fresher-tasting foods. All of us at C&W Appliance Service know how important it is to perform routine maintenance to extend the life of your appliances. Forget about wrestling the refrigerator away from the wall to clean coils and perform routine maintenance. The flip-up grille at the top of the built-in Sub-Zero provides easy access to the condenser and water filter for quick routine maintenance. Dust around the condenser every three to six months. Replace the water filter each year. The high-tech microprocessor control will automatically defrost the system when needed, based on your household use and climate. Sub-Zero refrigerators are built to last for decades. But if your Sub-Zero develops a problem, which doesn’t happen very often, C&W Appliance Service can fix it.